Tanglewood Lost is a large 10 to 18 player Unreal Tournament 3 multiplayer warfare level. 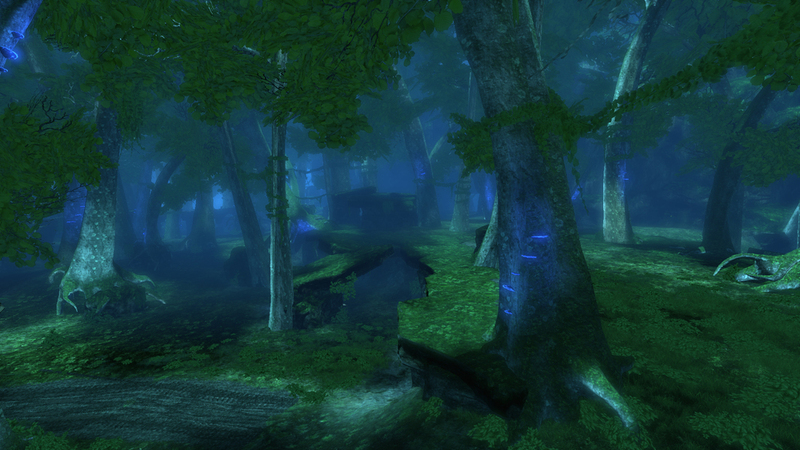 The level is set in a forest wetland with large twisted trees, the canopy almost blocking out the sky. Once inhabited by a great civilisation all that remains are scattered ruins and architecture built around the trees themselves. The two teams fight for control over the wetland and the Lightning Temple at its heart. I developed this level to gain experience in building larger gameplay spaces in the Unreal Engine, as well as importing and using some of my own art assets. Many of the level’s internal goals fed into the choice to have multiple fronts on the battlefield, including an unlinked capture point (Node) in the middle of the level. The middle node, or the Lightning Temple, also provides an additional gameplay objective that is always active. The play space is symmetrical, but the environment that surrounds it is asymmetrical. This gives each area visual differences key for player navigation, whilst also providing gameplay that is as balanced as possible for multiplayer matches. Create addictive and compelling multiplayer gameplay. Reward the player for tactical thinking. Foster the social multiplayer experience. Provide wish fulfilment and reward exploration. Immerse the player in the level and create a strong sense of place. Tanglewood Lost pits two teams against each other in a symmetrical play space. Both the red and blue team's bases are inset into the mountains that border the northern-east and south-west edges of the level. The level design uses branching links to create multiple 'fronts' at the north and south Tank Nodes, which create choke points at these edges of the level. This fosters the need for communication and social interaction in the multiplayer setting for success. This codependency on other players will help create a deep and rewarding experience. Additionally these multiple fronts create different tactical choices regarding which attack route each player takes, empowering the player and increasing the strategic depth of the level. In the centre of the level a large cave holds the Lightning Temple, a node that does not provide any links, however capturing it provides other bonuses. Namely, after a team holds this temple for 60 seconds lightning strikes down on the opposing team's Power Core, damaging it. The Lightning Temple further reinforces multiplayer coordination and adds an additional strategic focal point. At any given time for the player there will be many options on where to be within the level to make a positive impact towards overall victory. 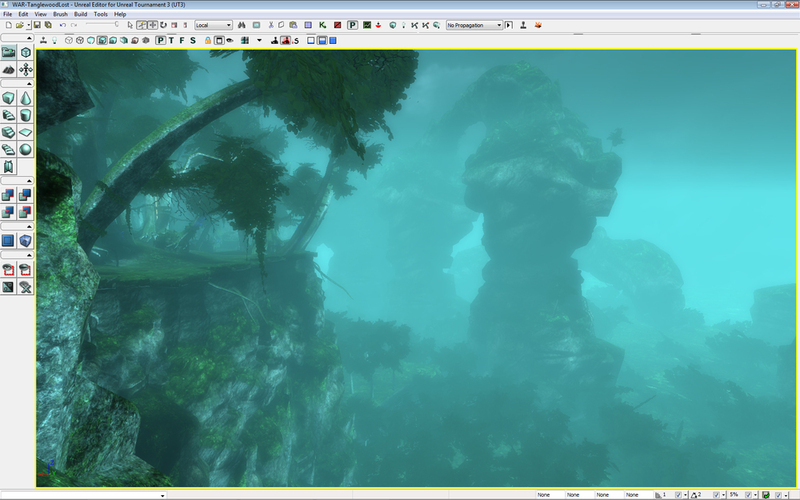 Blocking out the landscape of the level with the terrain tool in UnrealEd was the first step when building Tanglewood. This was a very large space that needed feel big, while housing focused and contained gameplay. 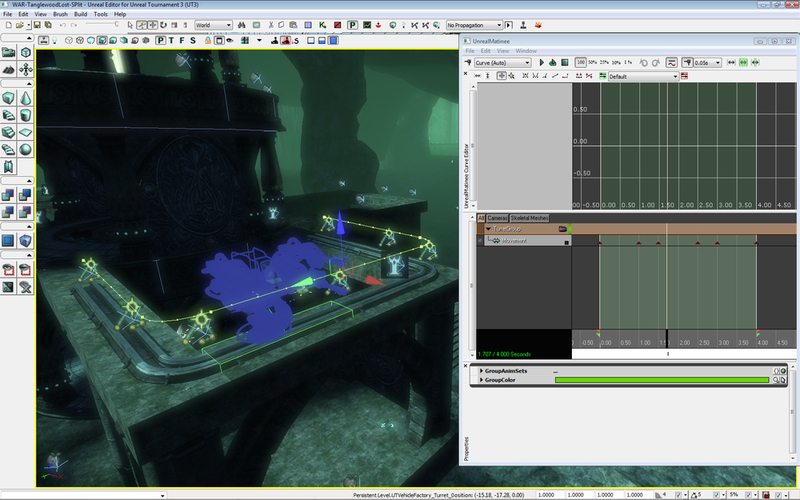 Bases and node links were set up quickly to make sure that the level was functional and playable as early as possible. Large environmental details like the central cave were also added during this stage of development. Here I was looking at the feel of the spaces in the level to better inform the design going forward. Using BSP I started blocking out the main base structure, including the aqueduct that formed the outer wall. I was keeping the three main attack sight lines in my mind during this stage and shaping the terrain around the bases accordingly. The dip on the right side of the base provided a back door entry to the Power Core (critical game objective). At this stage of development I played around with the depth of this trench. The destroyed passageway at the end of the trench was added early as it was crucial to the gameplay. When blocking out the top floors of the main base I played around with how far the spawn room should be from the defensive objective. It was surprising how close it could be without giving an overwhelming advantage to the defence. The Link Nodes (capture points) were blocked out next, I used a few static meshes during this phase as they fit the pagoda style structure of the nodes perfectly. It was important to block out the length of the aqueduct linking the main base to the closest nodes. I did this using BSP. During this process it became clear that there would need to be a tower between the main base and the nodes to adjust the height of the aqueduct. Luckily, this turned out to be great for the gameplay, allowing players access to a sneaky sniping spot. With the aqueduct connected to the node I could build out the defensive walls and add the tower. A view looking towards the main base from the connecting node. I added the jump pad to the this node fairly early so that I could tweak height of the tower in context. The large tree was added as a rough model at this stage as it would affect sight lines significantly. I finished the block out of the main base by adding the doors, windows and outer walls. I placed the two waterfalls for reference. The basic structure of the Tank Node was added using a combination of BSP and meshes. I tweaked the size of the choke point using the cliffs and I deliberately left the BSP easy to tweak as I knew this may change during gameplay refinement. 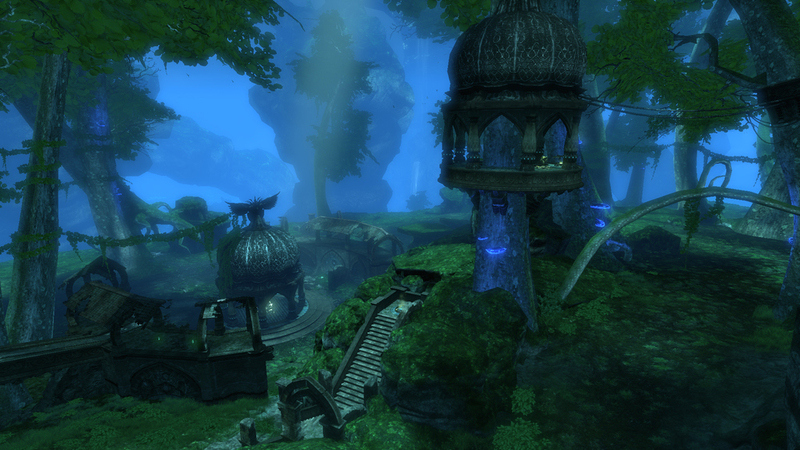 Like the Tank Node, the Lightning Temple node was blocked out using a combination of both BSP and meshes. I also added rock pillars to the cave as I started thinking about the sight lines from the temple outwards. 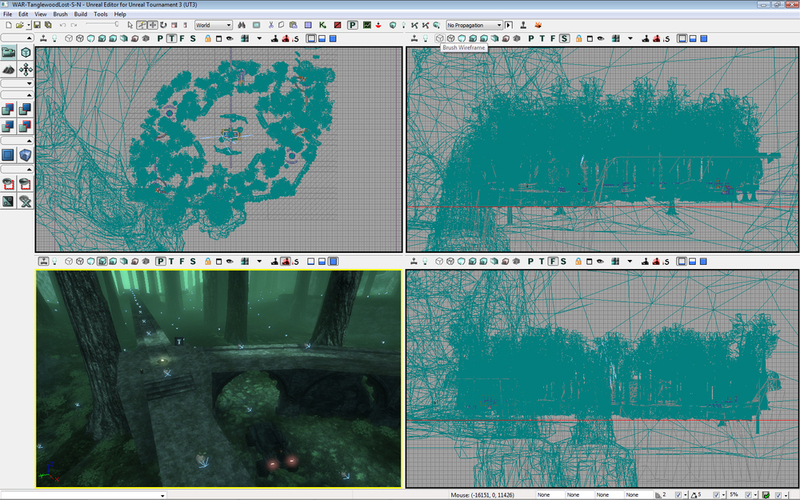 Placeholder tree meshes were added as they would effect the structure of the level going forward. With the structure of the level completed. I added pickups, AI pathing, jump pads, vehicles and turrents to create a functionally playable gameplay space. I began with the Temple. Through playtesting it became clear that the bases needed a more powerful vehicle to start with, they didn't feel like they provided enough value past being the defensive objective. To remedy this I added a spawn of the medium class of vehicle to each team's base. To reinforce the tactical 'choke point' value of the Tank Node, two turrets were added that provided a large defensive bonus to the team that controlled these objectives. 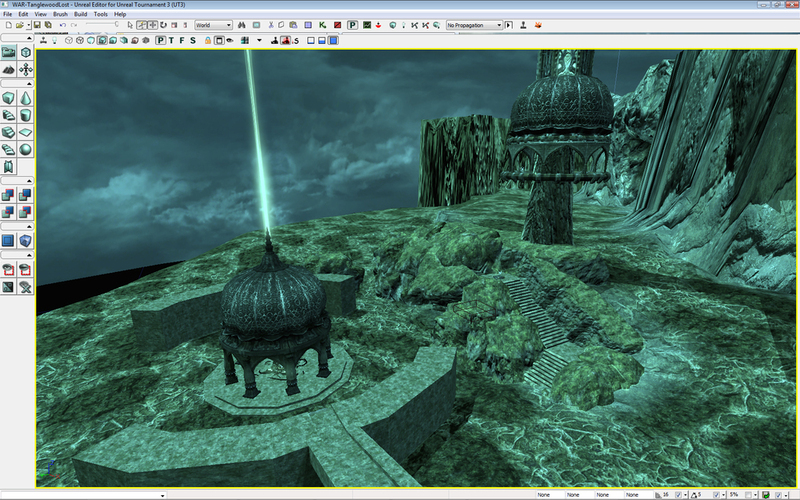 The turret functionality was developed in Kismet, the visual scripting tool for this version of UnrealEd. The turrets on the walls of the Lighting Temple provided an interesting challenge to implement. Their pathing was outlined in the animation tool, and linked into Kismet after the fact. It was a constant process throughout this stage of development tweaking the AI pathing to create compelling and intelligent adversaries. Defensive AI points were placed near key objectives that allowed the AI to set up sniping spots and mount a defence that made sense. Adding AI pathing for the aqueduct was especially difficult, as the AI would have a tendency to fall off! Eventually this was fixed by adding custom path weightings to the pathing points along the length of the aqueduct. Since the natural environment formed the large part of this level's space I wanted it to be striking and unique. To that end decided to model my own trees and hanging vines to fit the needs of the level. I modeled a some small glowing tree mushrooms that would serve as lights for the environment. These would add some additional color and atmosphere. With some new models and gameplay that was feeling good it was time to begin the enormous process of adding static meshes to the level. I began by setting a visual target in one section of the outside environment to find my quality bar. Meshing the closest node to each base allowed me to focus on the architectural style outlined in the original LDD. 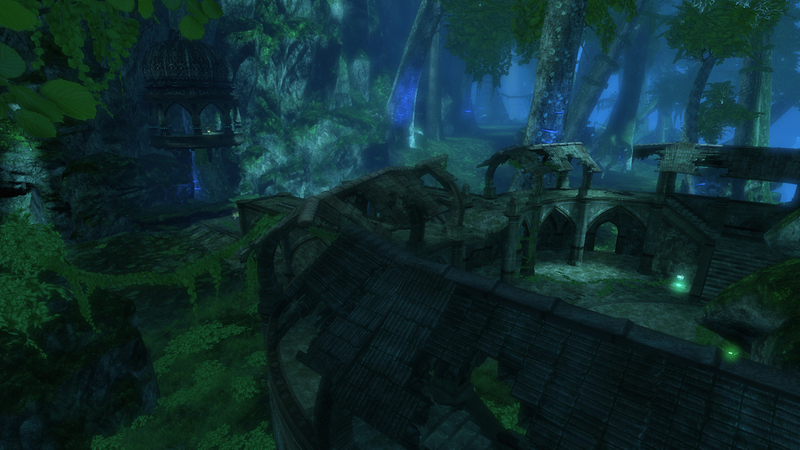 Ruined anchient arches were added for visual flair and to provide extra cover for players defending the capture point. The Tank Node was finalised and a large statue was inset into the cliffs behind it to provide a sense of scale. For the walls of the main base I kept some of the BSP structure and framed it with mesh trimmings. The roof of the main base was quite a challenge and required a number of meshes. Luckily, I was aiming for a ruined/run down aesthetic which made it considerably easier to complete. After the roof of the main base was added I worked extensively on the inner power core room. The cross beam was added as a vantage point for players cunning enough to drop in from one of the holes in the roof. 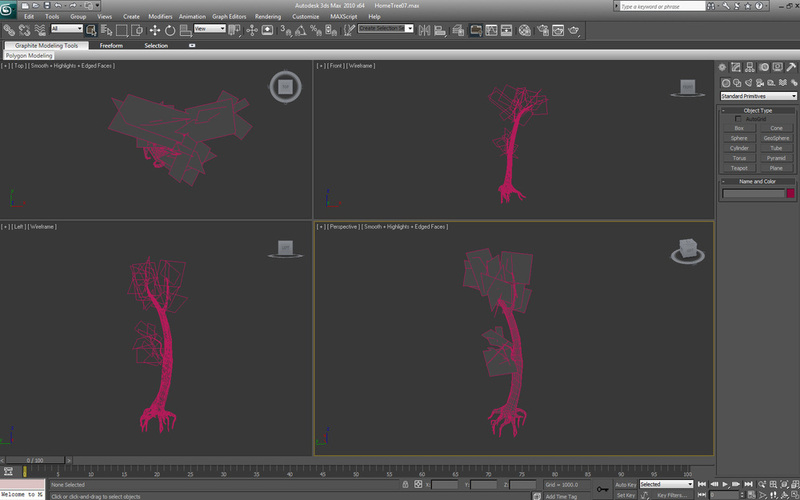 The base tree model was finalised. I added a vine wrapping around the outer tower to provide some visual storytelling - this structure is old, really old. The last main section of the level treated to a healthy dose of static meshes was the Lighting Temple. I was happy with the BSP basics and mostly placed meshes as trimmings. 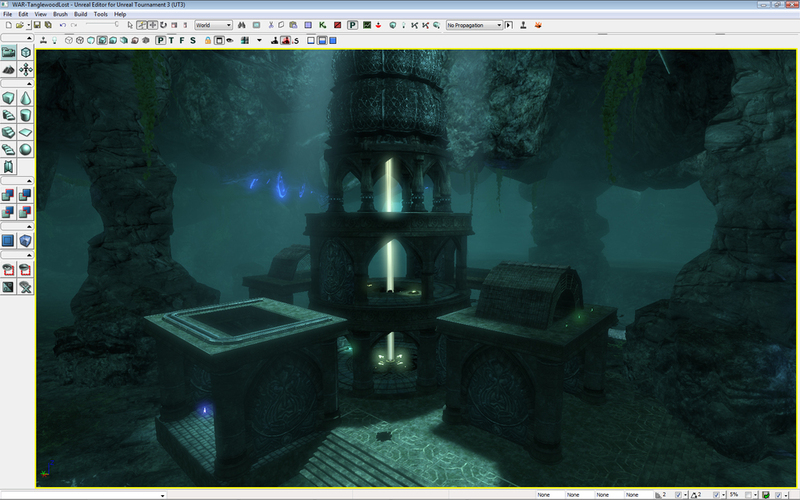 God rays were added to frame the Temple, popping it out from the surrounding cave environment. Caches of items were placed throughout the smaller caves in the outside sections of the level. I wanted players to be rewarded for exploration. I developed a few custom flag textures to further differentiate the two sides of the map, one for each team. I added some large rock pillars to the distant environment creating a big 'WOW' moment the first time a player sees it. I tried to create dramatic shapes silhouetted against the horizon. Vines and ground creepers were added to the Power Core room as it wasn't quite up to the visual quality bar set by the rest of the level. 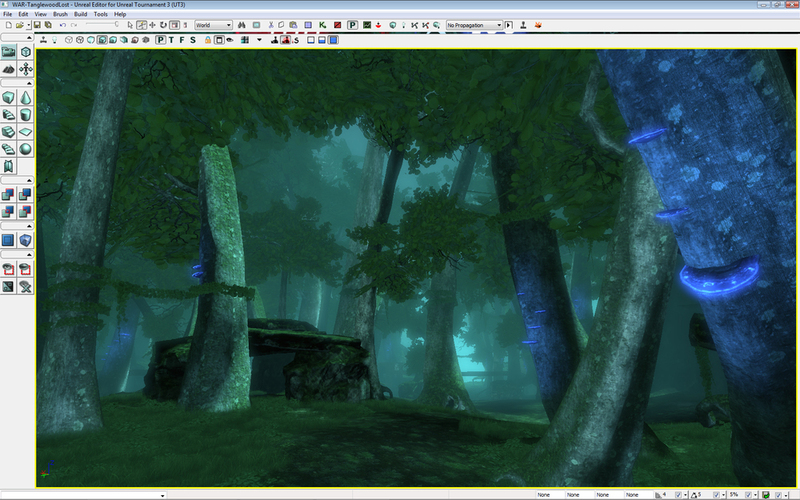 Hanging vines and extra waterfall effects including ambient sounds were added as the finishing touches to Tanglewood Lost.